Spain coach Julen Lopetegui drafted in Alvaro Odriozola, Jonathan Viera and Aritz Aduriz on Monday to replace the injured Dani Carvajal, Andres Iniesta and Alvaro Morata respectively for World Cup qualifiers against Albania and Israel this week, Owojela’s Blog learnt. 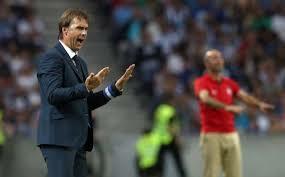 Lopetegui also has the task of calming tensions around the squad in the wake of Gerard Pique’s statement that he will retire from international football if Lopetegui or the Spanish Football Federation deem his defence of an independence referendum for Catalonia problematic. The referendum, deemed illegal by the Spanish government, sparked violent scenes in Catalonia on Sunday. Pique is due to arrive in Madrid to meet up with the rest of the squad later on Monday. Real Sociedad full-back Odriozola and Las Palmas midfielder Viera have received their first call-up to the Spanish senior side, while veteran 36-year-old striker Aduriz is rewarded for his fine early season form. Carvajal missed Real Madrid’s 2-0 win over Espanyol on Sunday due to a virus. Barcelona said in a statement that Iniesta will be sidelined for 10 days due to a hamstring strain, whilst Morata was also forced off early in Chelsea’s 1-0 defeat to Manchester City on Saturday with a hamstring problem. Spain lead Group G of European qualifying by three points from Italy with one win from their final two games likely to be enough to automatically qualify for next year’s showpiece in Russia thanks to their far superior goal difference over the Italians.